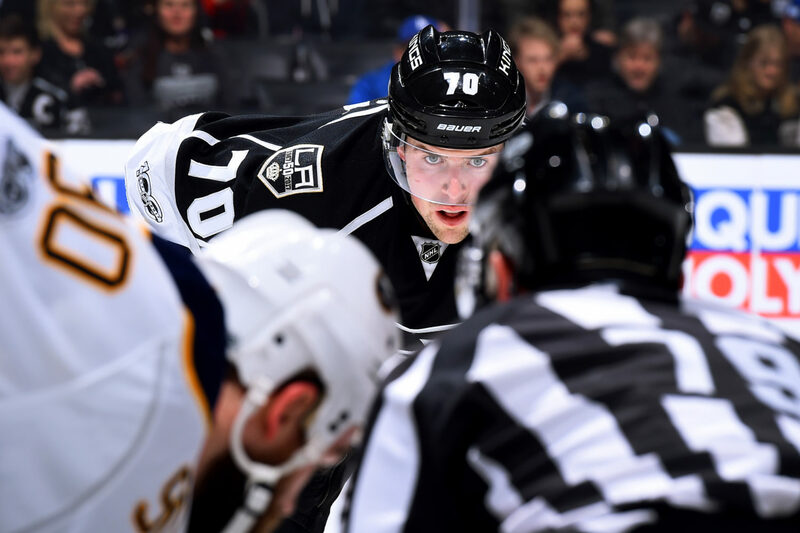 -The Kings-Sabres match-up has been dominated by home teams, and Los Angeles has done an excellent job keeping Buffalo off the scoreboard at Staples Center for the heavy majority of this decade. Here’s your reminder that the Sabres have not scored in downtown L.A. since Craig Rivet’s third period goal in a 4-3 Kings shootout victory on January 21, 2010. Since then, Los Angeles has shut out Buffalo by 2-0 scores in each of their last four Staples Center meetings, compiling an impressive 263:53 shutout streak. -The word on the street: 20-year-old forward prospect Austin Wagner, who underwent shoulder surgery in early June, has resumed some light skating. There was a red no-contact jersey hanging in his stall Saturday morning. He’s still a ways a way from getting into any sort of practice stage, let alone an assignment to the WHL’s Pats or the AHL’s Reign. Stick tap to the keen eyes of LA Daily News Kings beat writer Clay Fowler, who saw him on the ice early Friday. -Eden, N.Y. native Alex Iafallo has been an interesting story over the first two weeks of the season, one that’ll continue through tonight’s game as he faces off against his home town Sabres. Yes, he was a Sabres fan growing up, and fortunately any memories of 1999 are hazy, since he was only five and a half years old when Brett Hull’s skate was in the crease. “I don’t remember much, just a lot of commotion around,” he said. Enough of that controversy. It’s always a special day the first time a player faces off against their hometown team. He was a fan of Dominik Hasek, Chris Drury and Derek Roy when he was younger. But towards the end of the summer, as he prepared to return to Los Angeles for training camp, he skated at the Harborcenter facility adjacent to KeyBank Center alongside players like Jason Pominville and Zach Bogosian. It’s not a bad run for a player who played a lot of Triple-A and travel hockey until he was 18 and joined the Fargo Force of the USHL. By the time he stepped onto the Minnesota-Duluth campus a few months shy of his 20th birthday, he hadn’t attracted a great deal of attention from OHL teams, though he did attend several NHL development camps throughout his Bulldog career. In his senior year, when he potted 21 goals as part of a 51-point, 42-game effort, necks had strained by virtue of how hard heads had turned. But Iafallo isn’t really thinking of his career path – or his first career point in Wednesday’s overtime loss to Calgary – when he takes the ice tonight. There’s more on Iafallo via Mike Harrington of the Buffalo News. Via Harrington, Okposo has been ill on this trip but played through it in Thursday’s loss at San Jose. It appears there’s a decent chance he may play in Matt Moulson’s spot on Ryan O’Reilly’s line. Robin Lehner is expected to start in net; he’s 1-3-0 with a 2.58 goals-against average and a .921 save percentage in his career versus L.A.
-John Stevens quotes will follow. Enjoy your Saturday, Insiders.